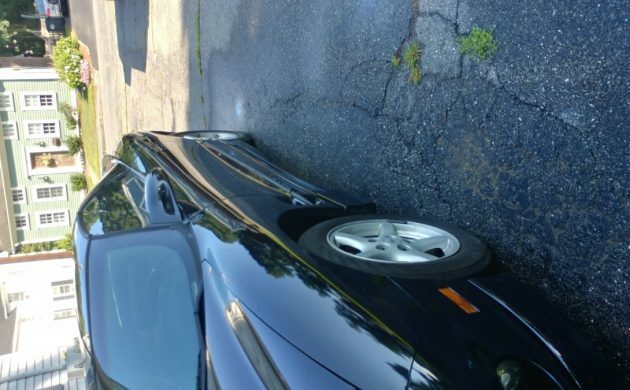 I’m fairly certain this battered Trans Am popped up on Facebook a few weeks ago, as photos were circulated showing a near identical car in Connecticut that had long been parked at a gas station. My memory could be foggy on some of those details, but for it to show up in Rhode Island a short time later, it seems like the odds are good it’s the same car. 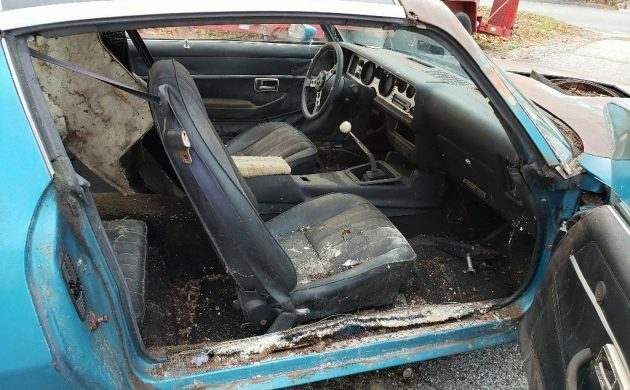 You’ll find the 1979 Pontiac here on eBay with its door handles crudely cut out due to the door locks being seized; one has to wonder if a locksmith could have helped. 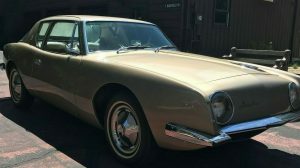 There’s lots of desirable equipment still attached, from the 400 motor with the Shaker hood to a manual transmission and positraction rear end. It also features A/C and disc brakes. The seller notes that the floors and the trunk are both rusty and will need to be cleaned up and repaired. Most impressive is that it still has a title, as many New England states don’t require one for cars over 25 years old. 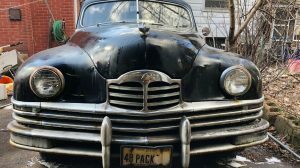 The seller says it was parked in the same spot for 23 years, which helps explain the high levels of decay we can see all around the car, from the fenders to the doors. All that being said, however, it still looks better than many northern cars that have sat for this long, as the door jambs don’t appear to have any rot and the rear quarters look solid. Pictures of the rusty areas would be helpful, however. 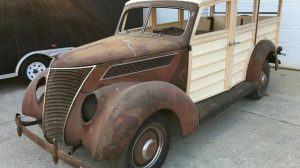 The seller is asking $2,800 with the option to submit a best offer and does have rot-free fenders to include. 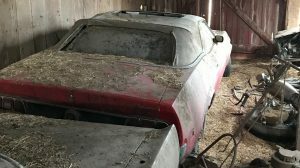 Down in the large Georgia collection listed as a Barn Finds Exclusive is a car in a similar state, but with better floors and doors that haven’t been cut up (and that still open!) Similarly, we have rot-free T/A fenders to include with the sale as well. 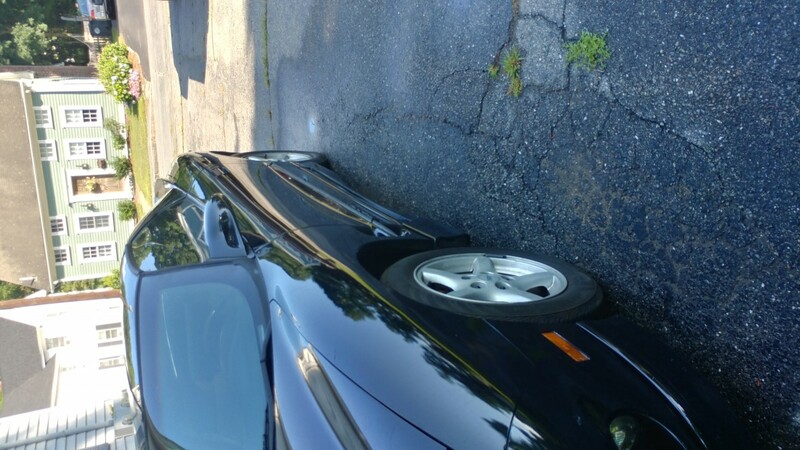 Which cheap Trans Am would you buy? They just “needed to get in” so they sawed open BOTH doors? I don’t think I’d ever buy anything from somebody that unresourceful. Even breaking a window would have been less invasive. You cant fix stupid…or those original doors, which presumably fit better than a set transplanted from another car. What morons. I hear ya, doors seized, so we cut the door handles out? Meh, it’s a POS anyway. Its a TA/6.6 with the W72-L78 high performance engine option with 4 speed transmission. Last year the Pontiac 6.6 motor was available with a 4 speed. YEeeeee HahhHaaaaa…..Jethro! Get my cuttin iron!!! Despite the Neanderthal treatment given both doors, the car itself looks fairly solid. If acquired along with the Georgia car, one might have an interesting project that could surprise the naysayers. 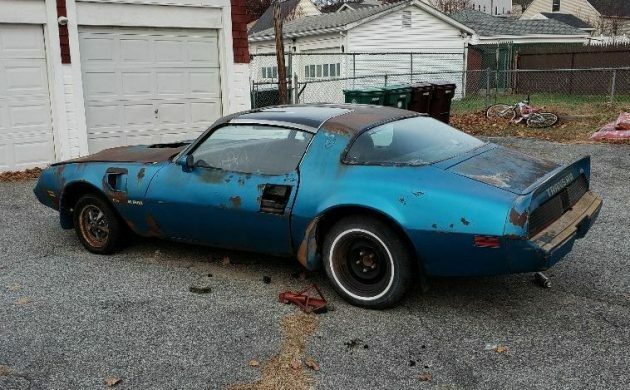 I’d be inclined to take the cash used to buy and transport those two cars and use it to purchase a more solid example, there’s nothing all that special about a ’79 T/A. I’ve got Neanderthal DNA (a small amount), so please temper your remarks! Not the original ’79 angled Hurst shifter handle for a factory ’79 T/A 6.6 Poncho with W72. One of those complete shifter assemblies will set you back a pretty penny. Why waste the money selling on eBay? You can’t fix stupid, but you can silence it with duct tape. Tsk tsk tsk. What a flashback that’s what these looked like in the late ’80s. Rusted out pile of crap. 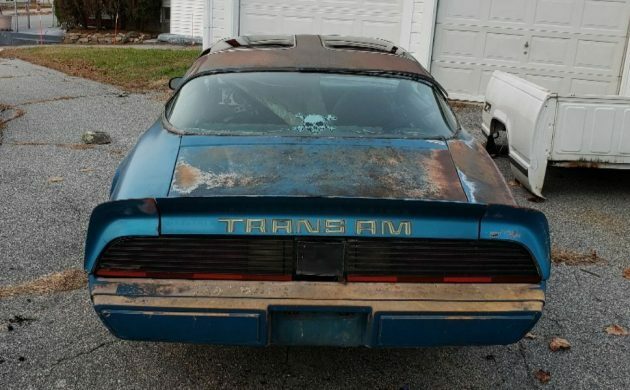 Turbo TransAm’s never came with a manual transmission from the factory. id buy the 4 wheel drive frame on top of the van. I’m only here for the comments! OMG its a T top. They never fit tight anyway. Pop the top off, don’t cut the doors! $2800?? This is a $500 parts car and I’m being very generous. Funny what runners we bought for $500 years ago….. I just don’t get it. I hung with a lot of gearheads in the 70’s and 80’s who did stupid things to Firebirds and Camaros. In hindsight I would have broken the glass, or even (gulp) smashed the T-top if I’d had enough to drink. But both doors cut open to get in? Is the car still locked? I’ve picked up rusty 74-77 Firebirds with nothing left of their core and the doors just hanging off worn hinge pins.I’ve been locked out and only needed a jimmy to get in the car. Not sure what the situation was with this one but I’ve had plenty of these F-body cars. I do recall the top of the window being very easily pried away or outward to where you could fit an arm in the gap to reach down and unlock the door. I did it once, maybe twice. @ Geoff. 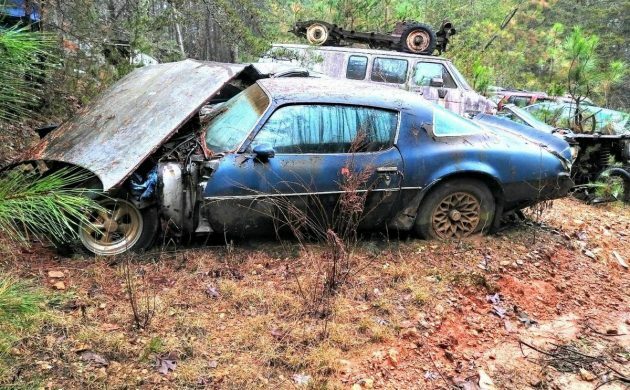 Last photo is of a SIMILAR car shown in that large scrap heap in Georgia featured multiple times on BF. Many of us were commenting, including Jeff Lavery, if combining the two might give someone a real nice ride.